All transactions are safe and secure with a reliable history in online purchasing behind each of our associates. 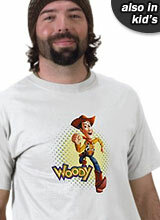 Buy the Cowboy Woody t-shirt to own Toy Story clothing and merchandise. Woody is a talking cowboy doll that Andy liked to drag around and even had a special place for on his bed. After being stolen in Toy Story 2 to complete a valuable collector's set, we discover that Woody is based on a character from a 1950's show called Woody's Roundup. We are then introduced to fellow cast mates that include his horse Bullseye, cowgirl Jessie and Stinky Pete the Prospector who are all being sold too. Despite everyone saying he will never be able to go home, he does not accept his museum fate. Catch this Woody t-shirt featuring him running to his final destination. In addition to the Cowboy Woody tee above, browse the Toy Story Clothing Gallery for more apparel like men's and women's clothes, kids shirts or hoodies.